Before we dive in to this recipe book of kitchen lighting ideas let's talk a little about what the lighting requirements are in a kitchen. 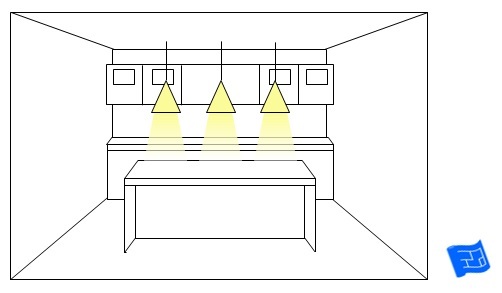 To decide on what lighting you need in your kitchen have a think about the activities that go on in your kitchen. There are some obvious ones such as food preparation and eating and that leads to the obvious requirements of ambient lighting, probably from the ceiling and task lighting from under the cabinets. What else goes on in your kitchen? Do you spend any other time in your kitchen apart from when you're preparing the next meal? If you have an open plan kitchen do you find that you're hanging out in there at times other than mealtimes? How about when you come to the kitchen first thing in the morning for a cup of tea or coffee or when the evening activity is winding down and it's time for a naughty snack before bed time? These occasions, outside of mealtimes, call for more atmospheric, softer lighting so take a look at the potential kitchen lighting ideas below to inject some atmosphere and drama into your kitchen lighting scheme. We'll start with the most interesting kitchen lighting ideas first. Here's some feature lighting elements that you can put together to give your kitchen lighting the wow factor. Under cabinet lighting is pretty standard in kitchens. 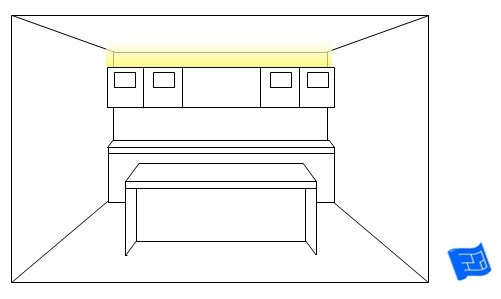 Adding lighting over the top of the cabinets gives you a soft glow in the early mornings or evenings. 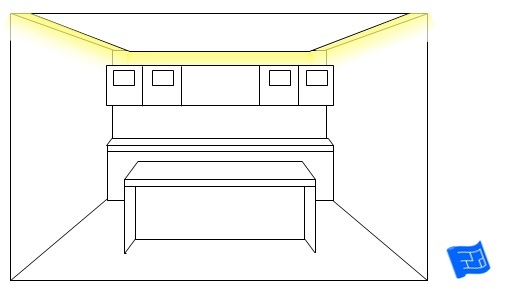 You could consider using spot lighting rather than a glow to create more light and shadow on the ceiling. 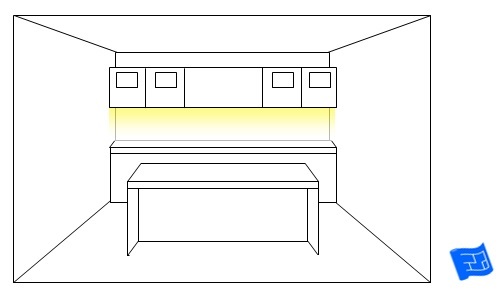 Both of the over cupboard lighting ideas above could be put on a dimmer controller so that you can really control the mood. 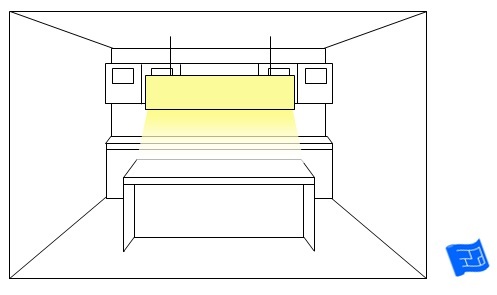 At full strength the light would contribute to the ambient lighting levels and low level the light contributes to the atmosphere. If you have cupboards with glass windows how about lighting them up from the inside. This is a great way to show off any special objects that are lovely to look at. For extra impact, consider decorating the inside of the glass cabinets in a contrasting colour or interesting pattern to make any objects inside stand out even more. For example if you have light kitchen cabinets try a dark colour or pattern on the inside of the cabinets and vice versa if your cabinets are dark. 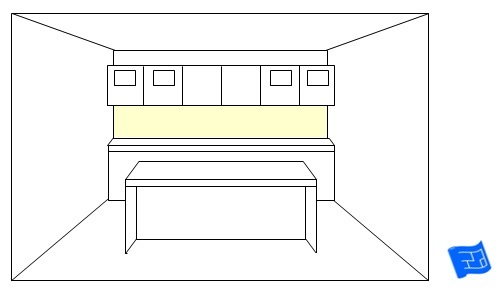 If you have especially beautiful cabinetry you can highlight the cabinets themselves with spotlights from the ceiling. One thing to watch out for with this is glare. 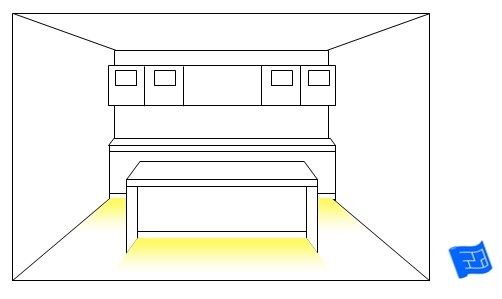 If you have shiny cabinets there will be some glare but if the light is gentle it shouldn't be unpleasant. 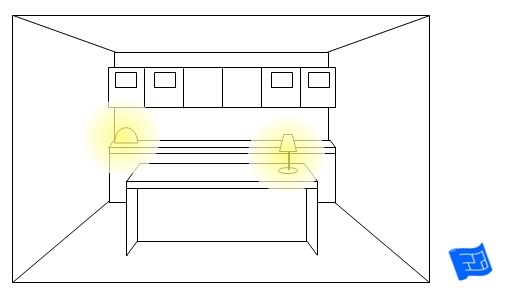 This lighting can also help you see what's inside the cabinets when you open them. How about lighting up the backsplash or a panel in the island? A lit up backsplash takes up slightly more depth than tiling so do some research to find out how much depth required to install the light. It should only be a couple of cm or under and inch. There are systems available in different colors and changing colors. If you go for lighting a panel in the island where there will be chairs in front check that the light installation can take a bit of wear and tear from feet coming into contact with it. Lamps aren't usually associated with kitchens but I've always had a lamp in the kitchen. A dome (translucent glass or plastic) on the counter top can always be cleaned if necessary and you can pick the size based on how much counter top space you have to spare. We're still on feature lighting so before we get to the standard task lighting onto the counter top here's a few ideas for feature lighting in your counter top. 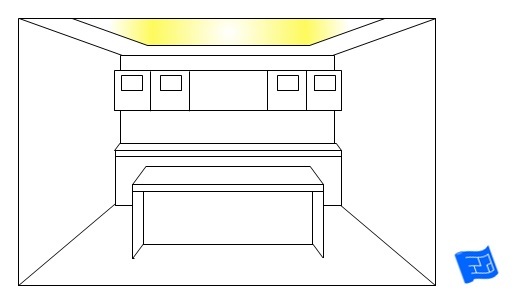 There needs to be room under the counter top for the light source to sit without being seen directly. We're after the glow of the light, not the glare of the light source itself. 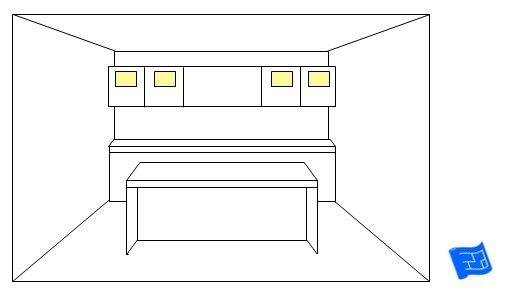 There needs to be enough clearance between the counter top and the door swing of the cabinets or drawers. See those little yellow dots on the picture below? They're just as subtle in real life. Just a gentle highlight of the are just under the counter top. Here's another idea which I haven't ever seen executed but I think it could be quite nice. How about uplighting from the countertop? 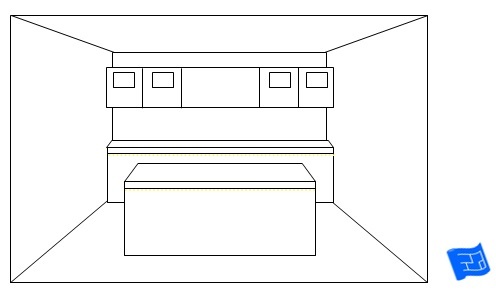 In the image below there are two uplighters toward the back of the counter lighting up the extractor and at the edges there are two lights set into the front of the countertop. There might be a few issues with keeping the countertop clean with the fact that the lights would need to be sunk into the countertop. 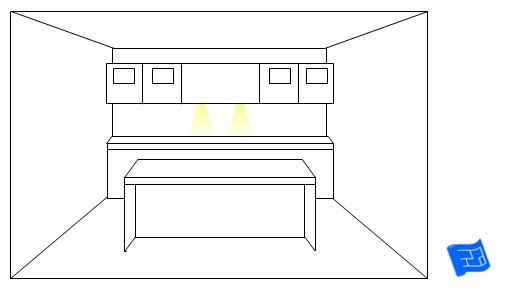 But we have uplighters set into floors, why not set into countertops? Moving down to the floor now you can light wash the floor with a glow from the toe kick. Just make sure you've cleaned the floor first. This lighting effect shows the dust if there is any. Another interesting kitchen lighting idea at floor level is to install spot lights in the toe kick. Small low power DVDs twinkle and don't demand that you've just cleaned the floor. Give your kitchen island a lift with in floor uplighting. Or maybe rope light at floor level. Again a bit of planning goes a long way towards getting the best of rope lights down near the floor. 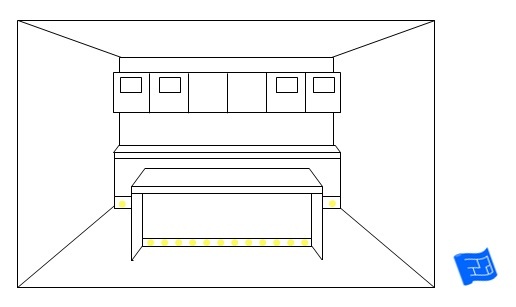 It's ideal if you can leave a channel for the rope light to sit in in the drywall or in the skirting board. It looks much more elegant sunk in at the bottom of the wall than being tacked on as an afterthought. And finally let's look to the ceiling for a bit of sparkle. Now let's look at the various ways you can light your counter tops, along the wall and on an island. 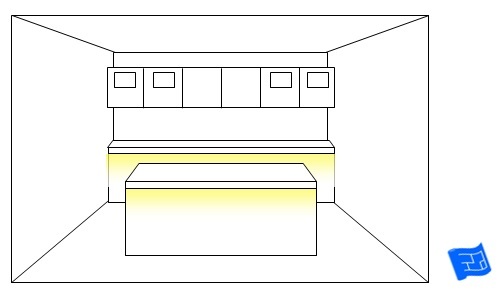 To start with here's the ever popular under cabinet glow. For something a bit more dramatic you might try under cabinet spot lights. I threw in some down lights from under the island counter top here as well. I guess they're more feature lighting though. 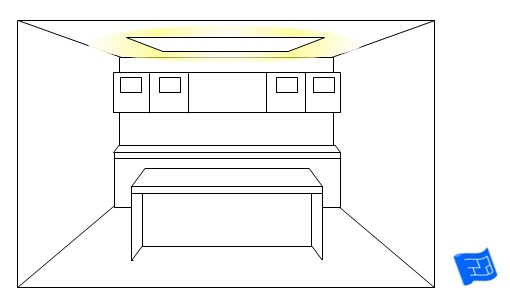 Many extractor hoods have task lighting built in. Be aware that the color of the light (depending on the bulb) and the nature of the light (beam or diffused) might be different from the style of your under cabinet lighting. If a difference is what you're after, that's fine and it's worth making sure that the difference between the lighting styles is complementary. 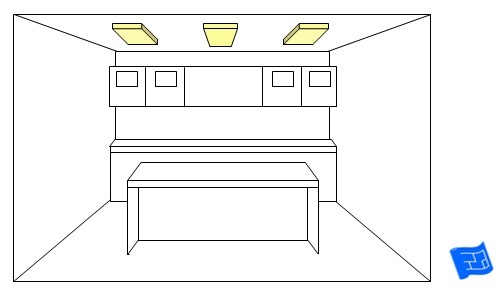 Otherwise take a bit of time to match up the lighting from your extractor hood and under the cabinets. The kitchen island can be a hive of activity and things, from food preparation to homework, to functioning as a mini-office. It's not vital to have light sources focused specifically on the island. Some choose not to on account of the fact that anything hanging from the ceiling has the effect of cutting off the sight line to the kitchen behind. If you do decide that island lighting is for you here's some ideas to consider. We'll start with traditional pendants. In general three pendants are more pleasing to the eye than two. You could choose pendants that have a very direct light beam to create three pools of light or pendants that will give more of an ambient glow. Or you could go for a bigger lantern that spans the island. Now it's time to think about a few kitchen lighting ideas for the general ambient lights in the kitchen. We'll start with what's perhaps the most common way to light a kitchen, but perhaps not the best looking. You guessed it - fluorescent tubes. What fluorescent lighting does have going for it is that it's relatively inexpensive. One way to use fluorescent tubes while improving the look is to create a ceiling lantern which spans a fairly large area of the ceiling and contains several sets of fluorescent lights. Another choice for ambient lighting is track lighting. Track lighting systems often house lights that throw a beam which has a bit of direction to it, that is it isn't completely diffused. This provides an opportunity to direct light onto the wall, up at the ceiling, down the the island, or onto the cabinets as you choose. Spotlights are always a good option. You can place them to accentuate design features. 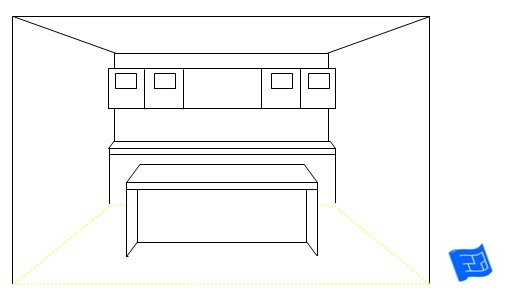 The pattern below highlights the rhythm of the cabinets and extractor hood on the back wall. Other options for ceiling lighting are ceiling coffers or cropped ceiling lighting. 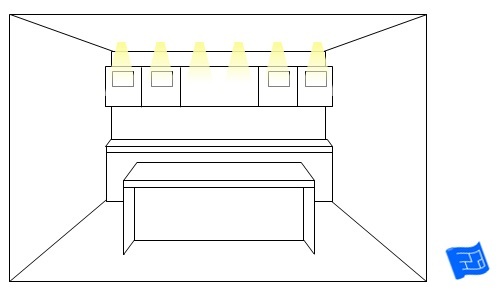 On a dimmer these lighting options can create a great deal of atmosphere. This dropped ceiling is over the whole area of the ceiling. This idea can also be used on a smaller area, perhaps a dropped ceiling over the kitchen island. Here's the how ceiling coffer lighting would look. 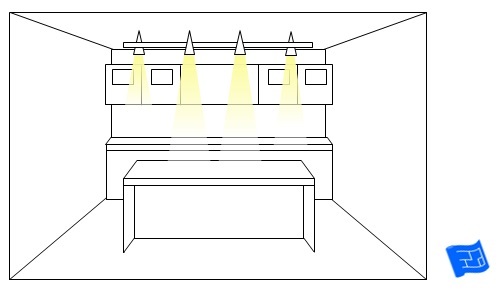 Let's finish off spend a little time on how to make the best of daylight in the kitchen. Wall space can be at a premium in the kitchen with windows space competing with above counter storage space. Skylights or roof lights can be a great way to get more light into the kitchen. Mirrors are a great way to boost light in a room. I thought about installing mirrors as the backsplash but then thought that it would be very hard to keep looking spick and span. Other possibilities for introducing mirros are to have a couple of cabinets with a mirror element in the door or maybe mirrors all the way up above the wall cabinets. I thought I'd share my Houzz kitchen lighting ideas ideabook with you. I've tried to find real life examples of all the different lighting options we've looked at on this page. Keep an eye out for how all the different ideas are layered together to create an overall scheme. If you have any kitchen lighting ideas to share I'd love to hear about them.